In his book Lapon d’une Renne, Voyages into the Arctic Regions (2010) Stijn Verhoeff addresses the alterations that occur in the current digitisation process of books and printed matters. Using some hundred e-books, Stijn sheds new light on the history of the Arctic, and he reflects on the digitisation process and its errors (images fading, colours and notes appearing, unfortunate scanning). The book is the outcome of an exploration of the archives of the Internet; it calls into question, in a poetic manner, the digitisation of knowledge. At the same time, it celebrates the elusive results arising from this process. After all, if we are to believe the Internet, neither history nor the Arctic region itself can be captured into a univocal image. 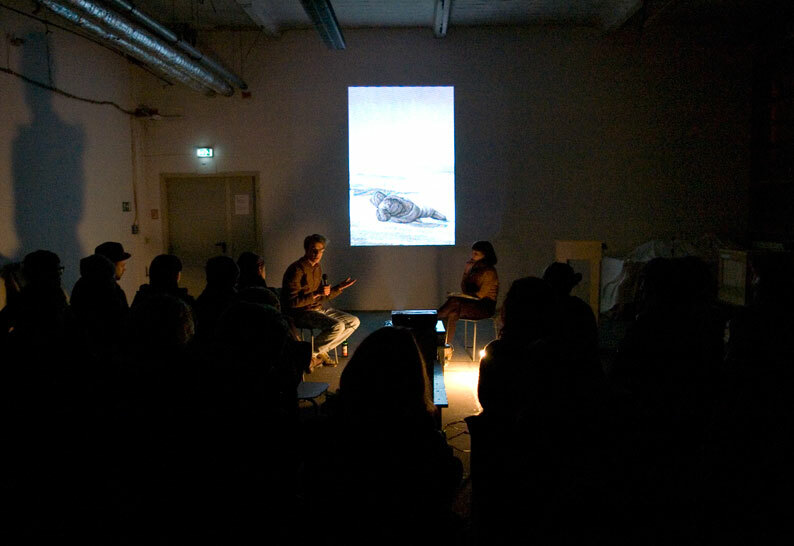 At an opening sequence for the book presentation, Stijn Verhoeff will present a video performance about archaeology and the Arctic. This performance consists of different speakers alongside underwater film footage of divers exploring a wooden shipwreck. Stijn Verhoeff studied Fine Art at the Gerrit Rietveld Academie and subsequently gained a Master’s degree in Documentary Film at Brunel University in London. Since then, he combines documentaries and art in film, photography and books. He developed Lapon d’une Renne, Voyages into the Arctic Regions as a researcher at the Jan van Eyck Academie, post-academic institute for research and production in fine art, design and theory. Stijn lives and works in Amsterdam.